Each year, the Costa-sponsored Fly Fishing Film Tour travels the United States with a suite of some of the best fly-fishing adventure films from around the world. Four years ago, a group of Virginia anglers discussed bringing the tour to coastal Virginia, but the expense of such an undertaking gave pause. In stepped Art Webb and John Fall. Webb runs a travel-related advertising and marketing firm. One of his clients is California-based Abel Reels, a high-quality fly reel manufacturer. At Webb’s urging, Abel agreed to sponsor the Virginia Beach tour stop. Webb and Fall are not the sort to be satisfied with doing the minimum. They wanted to host a first-class event, not just a movie night. Webb invited his friend, big-game fly-fishing legend Stu Apte, to come up from Florida. Apte, a former fighter pilot with 44 fishing world records to his credit quickly signed on, and Legends of the Fly (LOF) became the event’s working title. Now an annual event, LOF is a fun-filled educational fundraiser with the proceeds going to the Chesapeake Bay Foundation and Lynnhaven River Now. In 2016, LOF raised a whopping $20,000, thanks in part to a matching gift from Orvis. 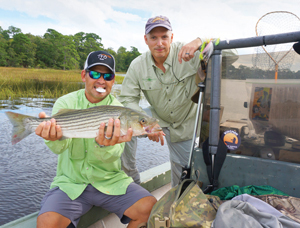 a benevolent foundation with a mission to assist in the rehabilitation of disabled active-duty military service men and women through fly-fishing. The Fly Tournament, held in October, attracted fifteen two-angler teams who ventured out at sunrise with hopes of catching a combined slam of redfish, speckled trout and flounder. The redfish and speckled trout would be easy. Flounder on a fly would be the more elusive challenge. Cory Routh and Ira Strouse with Joshua Borne on board won the contest with a three-fish total of 37 inches. Legends of the Fly returns to Virginia Beach on March 11, 2017 with tarpon fishing superstar Andy Mill, the Fly Fishing Film Tour and prizes that include fishing gear, artwork and guided trips, all for good causes and fun.